This beautiful canister is crafted from the finest pewter in Malaysia, a country renowned for its high quality pewter wares. Pewter canister is highly valued in China for its ability to keep the tea leaves stored in it fresh for a long period of time. 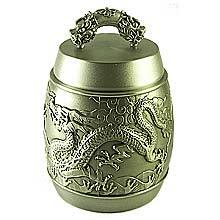 The canister's name, Long Mai Xiang Chuan basically means 'The Descendant of the Dragons'. Dragons have been part of the Chinese customs for more than a thousand years now and is often seen as a symbol of power and authority.